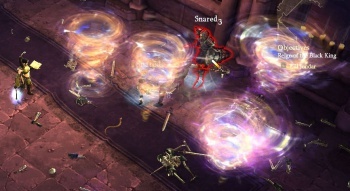 Energy Twisters targeting Jondar the Necromancer. Energy Twister (originally named Tornado) is a Force Wizard skill unlocked at Level 13, summoning a twister made out of energy that hurts everything nearby. The tornado is spawned from the Wizard, flying out in a semi-random direction and dealing damage to all enemies it encounters. Combining magical force and air, the Wizard brings a continuous, but time limited, twister out of the aether to destroy enemies. Refer to the Energy Twister rune effects article for thorough descriptions of all five rune effects in this skill, including screenshots, videos, strategy tips, and other related information. This skill sends out a twister from the Wizard, moving slowly away from the caster in roughly a straight line and doing moderate damage to everything it hits. It appears impressive, but it's high resource cost makes it only suitable for occasional use. This one was impressive, but very unpredictable. The graphic is great; you can see that in the Blizzcon 2009 gameplay movie, and it does more in more or less a straight line, but without some sort of tank I didn’t find it very easy to hit enemies with. Arcane Orb was nearly as damaging, far easier to aim, and cheaper on the mana. This Wizard just has so many cool active spells to try out it’s impossible to get a handle on everything in a short play time. Energy Twister was available in the BlizzCon 2010 demo, but wasn't one of the Wizard's starting skills. Skill tiers were removed for the July 2011 Press Event, allowing skills to unlock steadily from levels 1 to 30. Consequently, all skill levels were adjusted and Energy Twister became a level 11 skill. Energy Twister looks pretty, and it’s kind of fun to play with. I took more screenshots of it than of most skills, since the visuals were nice. Unfortunately, it doesn’t work very well, and I’m not honestly sure what the skill is supposed to do well. The tornadoes aren’t any good at AoE damage (too small a radius), they take a long time to reach even close targets, they move erratically and can’t be aimed, they have some slight stunning effect that draws monsters in, but it’s not strong enough to have much effect, and they don’t deal that much damage even when they do hit something. With the Patch 13 changes, Energy Twister was classified as an Arcane skill and moved to level 15. For March's Beta Patch 14, Energy Twister was dropped to level 13 but also nerfed a bit. Also, the category "Arcane" was renamed "Force". See the Wizard skill archive for more details on previous versions of Energy Twister (or Tornado) and other Wizard skills. Energy Twister is an updated version of the Druid's skill Twister from Diablo II. Wizard fighting skeletons with twisters. This page was last edited on 9 June 2012, at 07:57.